I would have said Ode, but that would entail poetry……and I haven’t written poetry, especially in a certain style, in a very long time I doubt I am any good at that. So we’ll just go with the flow and see where it takes us. 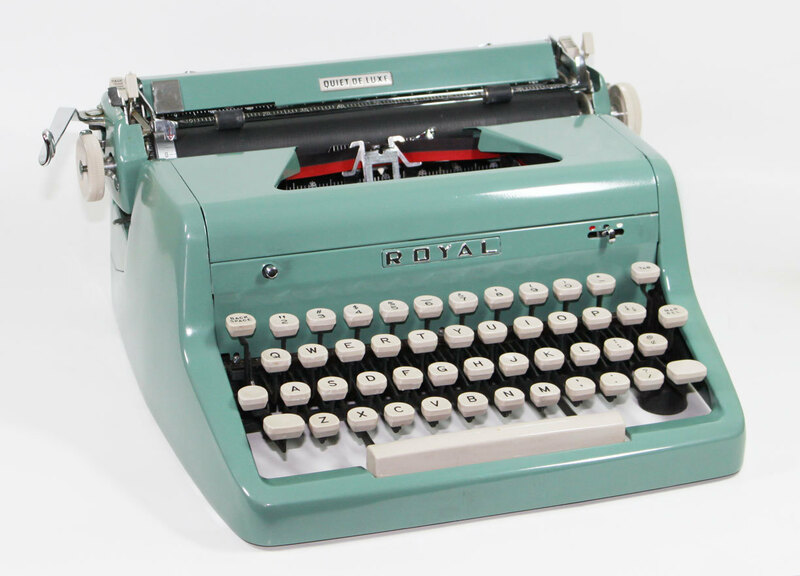 When I say the love of a Royal I mean specifically a Sea Green Vintage Royal Quiet Deluxe manual one from the 50’s. She was my first love, my Royal, and I dare say that I have loved anything (or anyone) as much as I have her. As much as I have had an awakening of all literature that I could stand nothing can replace the opening my mind took when she came into my life. It was silly, actually, how I came about it. Maybe fate, we’ll never know. All I know is that I was thirteen at the oldest and took a trip to the consignment shop on base. We lived overseas at the time and my father was in the military. Most of the time I felt like I had to be dragged by my hair to go to the consignment shop. It was all the way across base and tucked into the furthest corner building a young girl could imagine. It was not impressive at all. The moment you walked in it had such a dark look to it (did it have windows? if so, they were covered completely to me anyway), it was musty and full of…….junk. But someone’s junk is someone’s treasure as I found out soon enough. Bored and waiting for my family to finish their browsing I found her, my Royal. As ugly as one would think she was I couldn’t help but see a golden halo quality to it and everything else was drowned out. It was if she called to me, but how silly of a thought. I touched her, felt the curves of the sea mist beast, stroked the metal release bar, and tapped the keys ever so gently. I called to my father that I found something, he took no time at all to find me through the maze of the shop. He was amazed at my glorious find and perplexed. Why would his daughter want such an old thing as that, I’m sure he was wondering. I asked for it, no I will say I BEGGED for it. He looked at the price tag, something I honestly didn’t care about because I was so overtaken with the wonderful find. Twenty dollars, it seemed fair to him. I asked for help with it because it was so heavy (I was quite small at that age, I was always teased that I should have had lead in my shoes so the wind wouldn’t blow me away). He closed the hard-shell case and we left the shop with the best hidden treasure I had ever found. When we got home, I set it upon my desk. For a moment I looked at the tweed square box that housed my soon-to-be love. Such an ugly box, but I didn’t care, for inside of it was my future. I snapped open the case, and heaved the hefty typewriter out of it. It is funny that when it was built they considered it portable. Maybe for a full grown man or husky woman but I couldn’t see how it would be of any use for me to make it portable. The case got shoved away and I stared at it for moments, looking it over in all its glory. I checked out every possible thing there could be to check out and decided to grab some paper to give her a try. Nothing felt so exhilarating as when I was typing on her. The sounds of the metal keys as I pushed them down to hear the quick clacking sound it made once it hit the paper; the ding of the moment I needed to go to the next line or even the writers best friend, the backspace key. It had its own corrector to my amazement, white strips on the ink ribbon that with the flip of the switch I could make my mistake disappear. Every day I spent time on her, slaving away at ideas that floated around in my head, ones that I used to be able to only do from writing on hundreds of papers that surrounded my room. Seriously, the odd things I wrote probably wouldn’t have made much sense to me, even back then. But I wrote. And I wrote long and hard and I got better. I got better at the action of it getting over 30 words per minute, which is a great feat for using something that had no quick plastic keys, only hard push buttons. I now can fly across the keyboard like the wind was at my back and I STILL love the backspace key. The best invention ever. Of course there was no spell check on her, which is something I have to admit is great for a first draft, or fourth, of anything written to this day. As much as I grew with the times and everyone had one of the nice electric typewriters (we weren’t at the great word-processing age that we are now, but mind you I’m not close to forty so lets not age me quite yet). I chose to stay with my Royal. My ever faithful lover of the mind. I credit her for everything wonderful and wicked, and maybe even foul that has come from my mind and placed out for all to see (or none). As the years grew on, my imagination grew more vivid, my wording became clearer and more defined, and this passion of writing overtook me. It was at that moment I realized that it was something that I wanted to do. I didn’t care about being famous, because I stayed in reality and understood I would not be part of that minority. I wish I still had all that work that I had done, but I suppose fate pulled a cruel joke with a not-so-lovely teenager made it disappear, calling it rubbish and making me feel less worthy than I was. I put my Royal in its box, keeping it in my sight always. As I grew older I went back and forth between her and the literal pen to paper. It was much easier to carry with me a notebook for my visions than to cart her around. But she stayed there, and I loved her. I transferred my scribble (I do not say that lightly because even I have a hard time translating what I’ve written) onto my desktop, sometimes my laptop. The flash drive is the best thing ever and I can carry copies of my life’s worth on such a small thing. But I never forgot my Royal. I am told she is worth quite a bit on the market at this moment, I could never sell her. I just know that because of her my visions turned into the written word that made me the confident writer than I am to this day, churning out idea after idea. But she sits in her box. That disgusting hard-shell Tweed isn’t the best of anything but imagine it as a cover of a suitcase with its ugly olive and brown tones. What is inside the box is the most beautiful of creatures and will continue to be such a thing. Maybe one of these days, when I feel nostalgic and pets that wouldn’t be startled by its harshly soothing sounds, I will pull her out again and take yet another spin. Until then she is safe from the world. How many people do you know that can say they still have their first love? As morbid a thought that could be, in the idea of a human, I find it comforting that she will forever be by my side to be passed on through the generations beyond even my imagination. When I was a teenager, I read a lot of Stephen King, and I remember he was in love with his typewriter, too. Can’t remember what he used (it wasn’t a Royal). I also remember my mom had a Royal typewriter. You are on the right track! Because I feel Nostalgic I wanted to reblog one of my earlier posts when I first started up, and before I had such great friends with like minds.